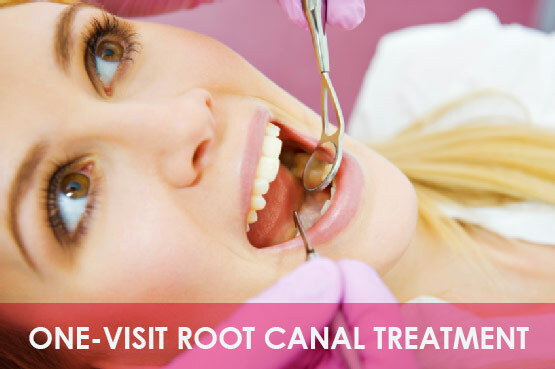 Root Canal treatment is the process of removing the inflamed or infected pulp tissue from within the tooth. It is also referred to as Endodontic Therapy. Root canal treatment is especially directed towards the one specific set of aims to prevent or cure dental pulp related problems. If one tooth is dead or infected, it will cause the death of other nearest teeth and it will also cause pain. The primary aim of root canal treatment is to access the cavity preparation, cleaning & shaping to remove the canal contents. Root canal treatment is generally preferred to to repair and save infected tooth. Treatments generally includes removing the natural infected areas of the pulp and cleaning and dysfunctioning it and then filling and sealing it with a rubber like material called gutta-percha. After all the primary examination and treatments then tooth is restored with an artificial crown for protection. Why Root canal is necessary? Cracked tooth: A crown is necessary to restore a cracked tooth to normal chewing function and prevent its loss to further function. Root canal treatment is often necessary to remove the inflamed pulp prior to crown placement. Traumatic Injury: May expose the pulp and may also disrupt the blood supply to the pulp. Dr. P.S.A.Varadarajan Dental clinic provides convenient way to restore dental health immediately through advanced dental care treatments. Root canal Treatment in Salem is one of the best option to restore your dental health permanently.